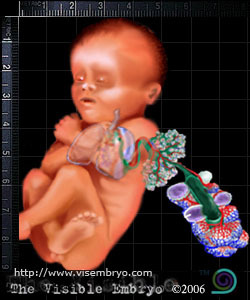 Fetal size: weight almost 2 pounds (910g). By this week, its crown-to-rump length is around 9.2 inches (23cm). Your baby is beginning to put on weight. Forebrain enlarges to cover all other developed brain structures, while still maintaining its hemisphere divisions. Eyes are partially open and eyelashes present. Sucking and swallowing improves. Lungs are capable of breathing air. Fetal body is two to three percent body fat. Testes of male fetuses are completely descended.